There was never a question. Owen Beverly Evans, Jr. was meant to be a doctor. But construction foreman, fundraiser and visionary are three more titles he’s added to his resume over a forty year career. The Decatur, AL native is hanging up his white coat today after four decades as a physician and twenty four years as Chairman of Pediatrics at Blair E. Batson Hospital For Children in Fondren. In medical school rotations, Dr. Evans and his classmates were seeing children with handicaps. One particular child stands out in his memory. “She saw a sea of white coats and broke out in a face of horror,” he recalls. “But she ran to me. I don’t know what that meant but it influenced me to pursue pediatrics.” After a summer fellowship in pediatric orthopedics at Children’s Hospital in Edinburgh, Scotland, Dr. Evans says the path was solidified. A 1973 Vanderbilt graduate, Dr. Evans married wife Lynn in 1971 and the couple, wanting to see more of the world, moved to Seattle. As a Naval reservist at the end of the Vietnam era, Dr. Evans was called into active duty unexpectedly and served 600 men as the ship’s doctor for a year in 1974. 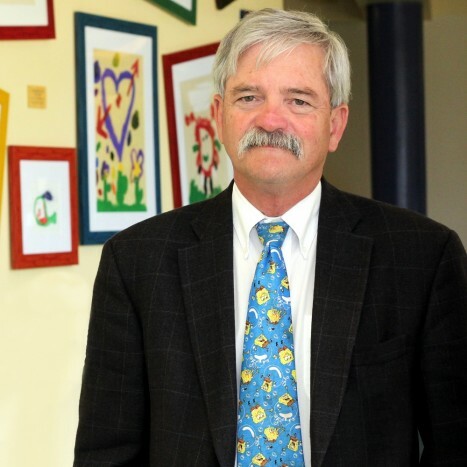 Dr. Evans finished his remaining days of schooling with a focus on pediatric neurology. Once his residency was completed in 1980, Dr. Evans was a part of the Vanderbilt faculty for three years. And then, the opportunity came to create his own program as head of the division of neurology at Batson. But Dr. Evans had no plans to stick around for long. With his feet wet in academic medicine, he decided to interview for other positions after just three years in Jackson. That’s when Dr. Blair Batson, the first chairman of pediatrics at Children’s Hospital, announced his retirement. He asked Dr. Evans to be the internal candidate to replace him. “I never thought in my life I’d be a chair of the department of pediatrics,” Dr. Evans says. That role became his legacy in 1989. He praised Dr. Batson’s leadership and creation of a solid foundation and a culture of patient care. The interior round building that forms the inner structure of the hospital, built in the early 70’s, was Dr. Batson’s doing. The post World War II increase in faculty and the residency program was his work as well. But the children’s hospital only made up a couple of floors and didn’t have its own emergency room or surgical suites. Dr. Evans looked to change that. “What we needed was a more modern physical facility.” Dr. Evans’ goal then became to create a true children’s hospital. In the days of Dr. Batson, family centered patient care was not the rule. “In the ’60’s, parents didn’t stay overnight and only came in during visiting hours,” Dr. Evans says. “There was one shower per floor, windows between rooms and no privacy.” He says buildings were designed around nurses in those times. With adults, most can entertain and care for themselves, but the needs of, say, a two year-old change the game. Dr. Evans is responsible for bringing in the first Child Life specialists to help design programs geared to the specific needs of young patients. One of those needs is that of an education. Children’s Hospital has an accredited school as part of their facilities. Dr. Evans says taking on the role of chair meant he would have desires to see the program grow. “A new hospital was my number one wish, but we needed community support.” Dr. Evans created that support group, Friends of Children’s Hospital, which helps not only with financial needs, but also with volunteers, events and more. While Dr. Evans initiated the group, he’s quick to diminish the role he played. “It was the leadership. Look what they did. Look what the community did.” After years of Pro Am golf tournaments, sales of car tags from Alabama and LSU alumni groups in Mississippi, the Mal’s St.Paddy’s Parade and Fondren’s Zippity Doo Dah® Weekend, the hospital has reaped the benefit of the generosity of many. Dr. Evans thanks the Junior League of Jackson who has been a “tremendous partner” in the hospital’s children’s cancer program, volunteering time and energies, helping to fund the building of a clinic nearly twenty years ago. He also cites NFL great Eli Manning (for whom the general pediatric clinic is named), Bank Plus, the McRae Foundation, the Colonel Sanders Foundation, Ronald McDonald House, the Candellighters and Children’s Miracle Network as contributors to the cause. One story of generosity particularly comes to mind when Dr. Evans recalls all who have helped to pave the way for a modern facility. He recalls: “I was taking care of child who had an inoperable brain tumor. I had been chairman for two or three months and the grandmother was in town and wanted to stop by and say thank you for the care we had provided. She said she wanted to give the hospital a small gift. It was stock – in a major company – worth $250,000. We put that money in a foundation to add more floors to the hospital and add a lobby. That one donation literally set the foundation of this place.” It helped us raise the money to open the hospital’s initial floors in 1996-97. Read more about Dr. Evans’ portrait unveiling and retirement plans here.